The current economic expansion started in June 2009, according to NBER, which makes January 2018 the 104th month of expansion from the last trough. This is the third longest streak after the 120 months long expansion from March 1991 to March 2001 and 106 months long expansion from February 1961 to December 1969. On an average, an economic expansion has lasted for 38.7 months since 1854, which includes 33 cycles. The median length of expansion is 30 months since 1854. Using most recent data, i.e. from 1945 to 2009, the average has been 58.4 months and median 45 months over 11 cycles. However, since 1981, the average length of an economic expansion has been 95 months. The expansion from November 1982 lasted 92 months and peaked in July 2001. The only other expansion since 1982, from November 2001, lasted 73 months and ended in December 2007. So using the historical data, the current expansion is very extended but if we use the most recent – last 35 years’ – data then it is just slightly above average. What it also means is that the U.S. is in full-recovery phase of a business cycle. There is a greater likelihood that the we are in the late Stage 4 to early Stage 5 of business cycle map (see Fig. 1) used by Stockcharts.com and Martin J. Pring. 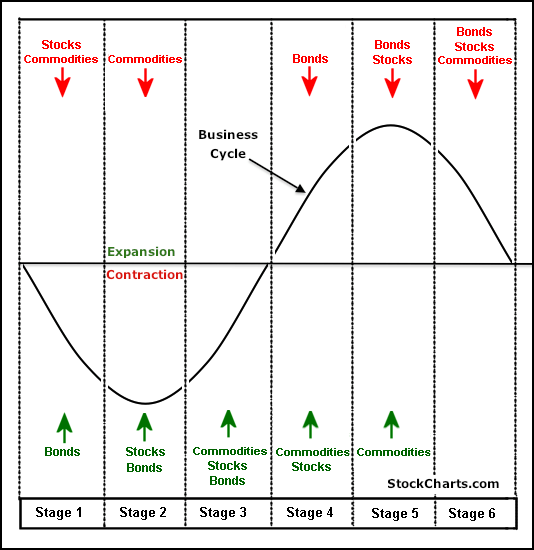 The Stage 4 marks a period of full expansion with both stocks and commodities rising and bonds turning down. Stocks had been rising for many months and now we are seeing signs of commodities picking up and bonds slipping (we will analyze them in the next research paper). In Stage 5 economy continues to grow but at a slower pace. Let’s see if the data shows any slowing down. In the Third Quarter of 2017, the U.S. output gap turned positive (see Fig. 2). 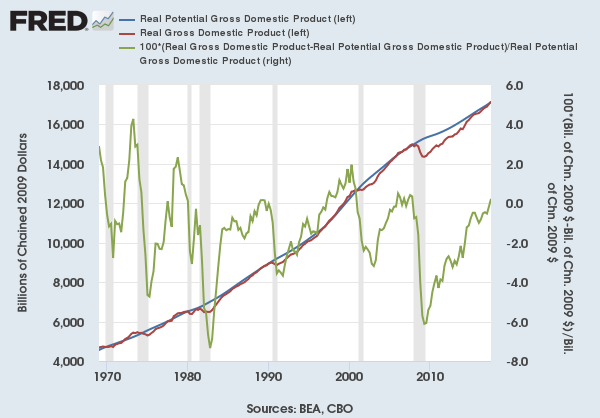 In other word, the Real GDP (red line in Fig. 2) is now higher than the Real Potential GDP (blue line in Fig. 2). This equation represents the difference between the two measures of GDP in percentage term. This measure turned negative in Q1 of 2008 and it stayed below zero till the Q2 2017. The positive output gap indicates that the economy is expanding and is running to its limit. All plants and factories are running at capacity, the labor force is fully employed and economic output is high. Usually, in periods of over-utilization, the economy overheats and the inflation picks up. The negative output gap means that the conditions are soft and the economy is sluggish. The industrial production declined from December 2014 to March 2016 but since November 2016 it as been rising and is nearing the high level reached in 2014 (see Fig. 3). The Fig. 3 also shows that before the onset of a recession, the annual growth of industrial production, retail sales and the leading index turn negative2. Such is not case at the moment. 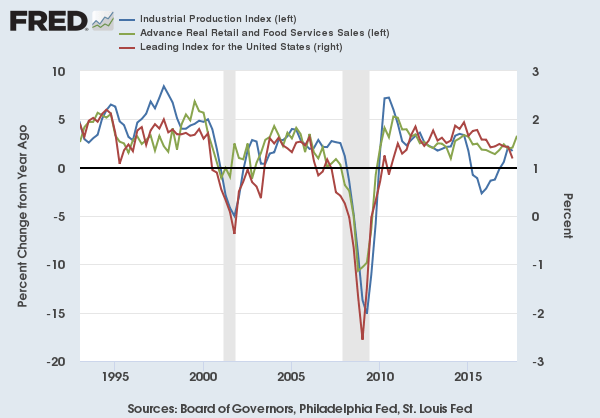 Even though the annual growth rate of retail sales and leading index is declining, the industrial production in increasing and all three are positive. The unemployment rate has fallen to 4.1% from a high of 10.2% in November 2009. This is lower than the NAIRU of 4.74% as computed by the U.S. Congressional Budget Office (see Fig. 4). NAIRU is an acronym for non-accelerated rate of unemployment. It refers to a level of unemployment below which inflation rises. 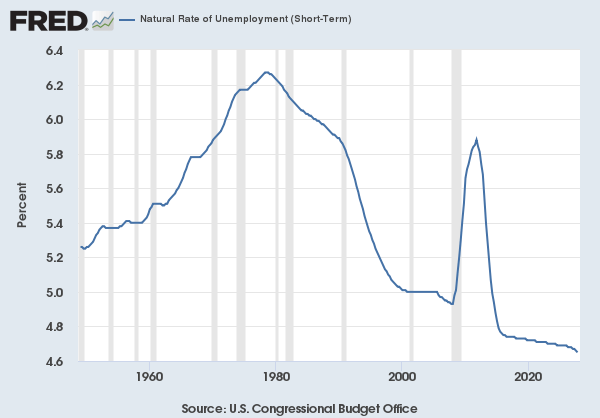 Federal Reserve states that NAIRU or the natural rate of unemployment is the rate of unemployment arising from all sources except fluctuations in aggregate demand. Estimates of potential GDP are based on the long-term natural rate. The short-term natural rate (Fig. 4) incorporates structural factors that are temporarily boosting the natural rate beginning in 2008. 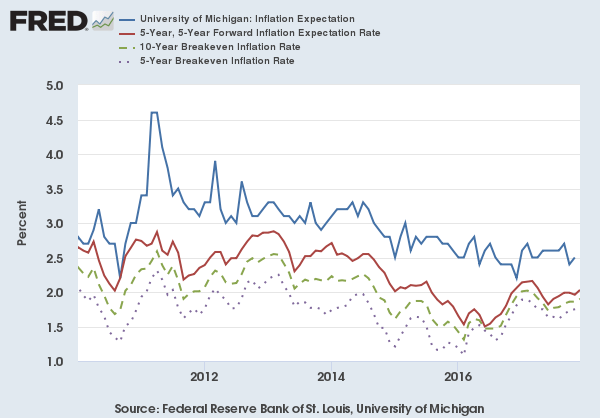 The short-term natural rate is used to gauge the amount of current and projected slack in labor markets, which is a key input into CBO’s projections of inflation. As the unemployment rate is below NAIRU and the inflation is not rapidly rising, as we will see below, we believe that the NAIRU is lower than 4.74%. The U.S. has added to employment level in each month since October 2010. However, the pace is slowing down. 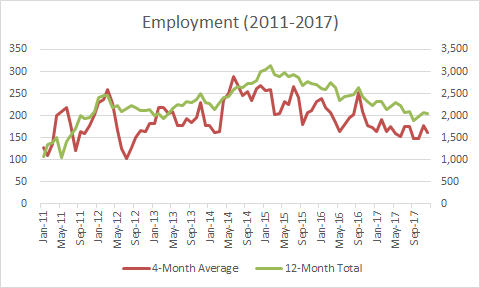 The 12-month jobs gain peaked in January 2015 at 3.129 million. It is trending down since then (see green line in Fig. 5). 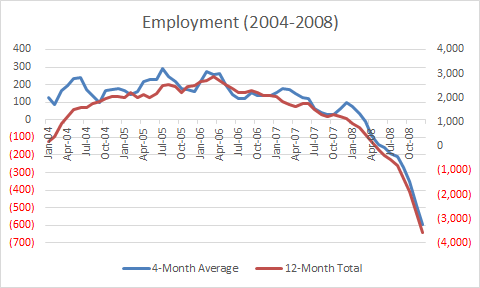 The 3-month average jobs gain is also trending down (see red line in Fig. 5). This declining trend matters because usually, both of these trend lines start to decline before the jobs-gains turn into jobs-losses (Fig. 6). It is not clear at the moment whether that danger is imminent or not but it is becoming more feasible. 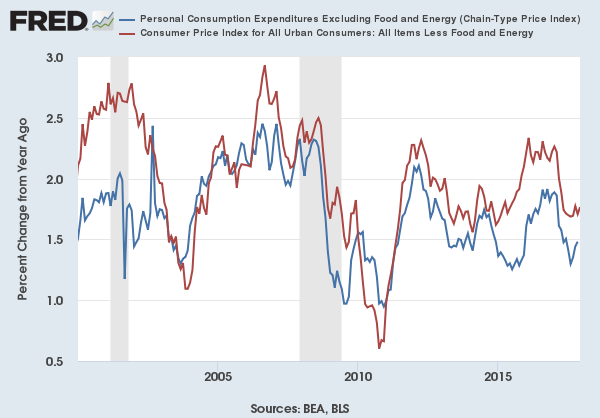 The inflationary pressures are rising but Personal Consumption Expenditures Excluding Food and Energy (Chain-Type Price Index), Federal Reserve’s preferred gauge for index is still below 2.0%, the target of Fed (See Fig. 7). PCE has fallen from October 2016 reading of 1.91%, the closest it came to 2% target. to 1.29% in August 2017. It is rising again but we doubt if it will break 2% target level soon. 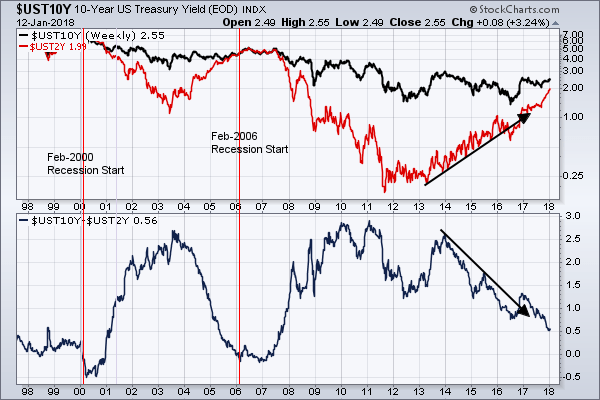 The spread between 10-Year Treasury yield and 2-Year Treasury yield is a good indicator for imminent recession. Since 1970s, once the spread turned negative then the economy fell into recession on an average after 15.6 month. After topping in 2011, the spread is declining (See Fig. 8). It bounced higher in 2013 before resuming the downtrend in February 2014. The latest downtrend started in December 2016. This spread is at the lowest level since the last recession in 2009 but still comfortably above zero. Another yield spread, between 10-Year Treasury and 3-Month Treasury, also provides similar insight. 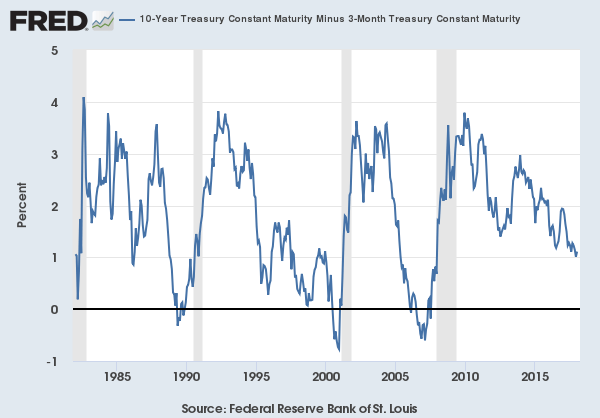 Since 1980, economy has taken 14.7 months to fall in recession after this spread turned negative. This spread turns negative after 10-Year and 2-Year spread. It is also trending down since December 2009 (see Fig. 9). The latest down leg for this spread also started in December 2016 but it too is, still, comfortably above zero at the moment. This means that there no imminent danger of the economy getting into recession. The major U.S. corporations are reporting great earnings. 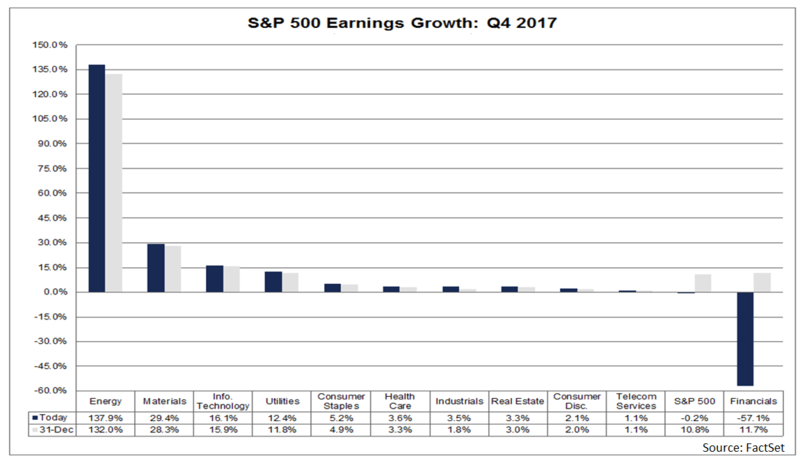 According to FactSet, the estimated earnings growth for the S&P 500 companies in Q4 2017 is 10.5% and all eleven sectors are expected to report earnings growth. 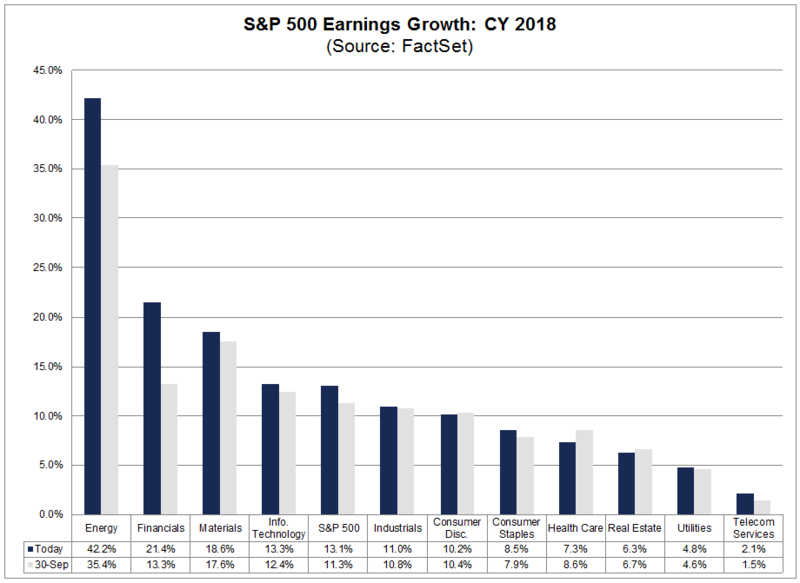 If the final earnings growth rate for the quarter remains 10% or higher, then it will be the third time in past four quarters that S&P 500 companies would report double-digit earnings growth. 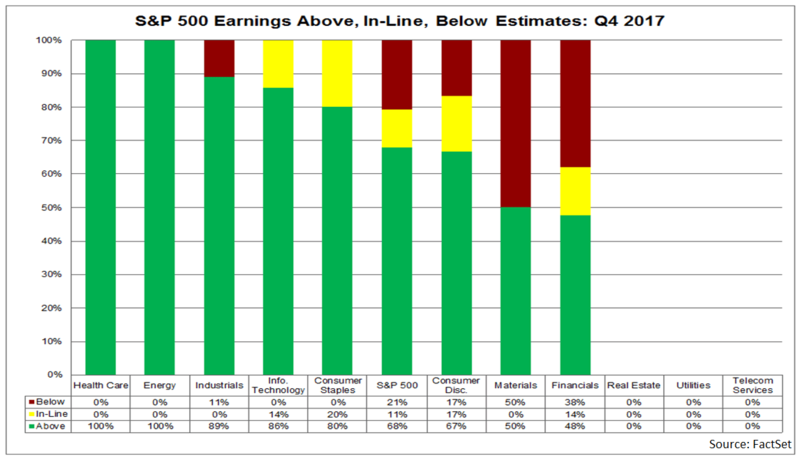 Digging deeper in the earnings announcements we find many good and some not so good news. In Q4 2017, the S&P 500 companies are announcing smallest cuts to EPS estimates in seven years. In Q4 2017, the bottom-up EPS estimate – the aggregate median EPS estimates for all the companies in the index – dropped by only 0.3%. 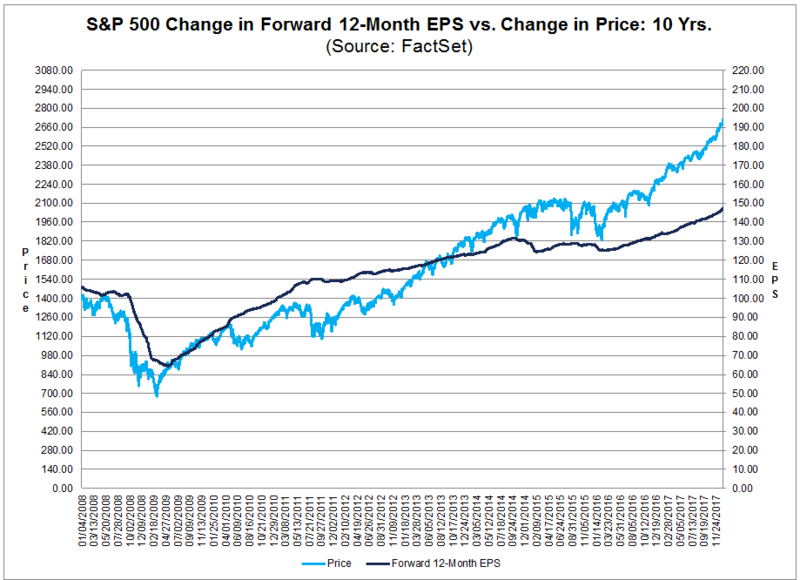 The 4-quarter average decline in bottom-up EPS estimates is 3.1%, the 20-quarter (five-year) average decline is 4.2%, and the 40-quarters (10-year) average is 6.0%. For the Q4 2017, 75 S&P 500 companies have issued negative EPS guidance and 35 companies have issued positive EPS guidance. The number of companies issuing negative guidance is below 5-year average, whereas the number of companies issuing positive guidance is above 5-year average. On September 30, 2017, the year-over-year sales growth estimates for S%P 500 companies was 7%. The latest estimates is for a sales growth of 6.7%, due to upward revisions. All sectors are predicted to report revenue growth. Energy, Materials, and Information are expected to report double-digit revenue growth. On the other side of the spectrum, Telecom Services and Financials sectors are predicted to report the lowest revenue growth. The analysts are expecting the earnings to continue at double-digit levels in 2018. However, they are also projecting lower year over year revenue growth in the second half of 2018. The estimated earnings growth by quarter for 2018 are 12.0% for Q1, 12.3% for Q2, 13.4% for Q3 and 13.0% for Q4. The estimated revenue growth are 6.8% for Q1 and Q2, 5.6% for Q3 and 4.4% for Q4. For 2018, the earnings are expected to grow by 13.1% and revenue by 5.7%. Last week, the estimated earnings growth for Q4 was 10.8%. This week the estimates are for 10.5%. This downward revision is mainly due Financial sector. The current estimates are also lower than the estimates of 11.3% on September 30, 2017. Seven sectors have recorded a decline in estimated earnings growth and four sectors have recorded higher estimates. The current forward 12-month P/E ratio for the S&P 500 is 18.4, which is above the 5-year average of 15.9) and above the 10-year average of 14.2. The current ratio is also above the ratio of 17.8 recorded at the start of Q4, ie.e on September 30, 2017. Since then the index has risen by 8.1% but the earnings have risen by only 4.0%. The leading index predicts the six-month growth rate of the coincident index. In addition to the coincident index, the models include other variables that lead the economy.